During a meeting of military officials in Sochi, Russian TV crews captured footage of a document not intended for public consumption. 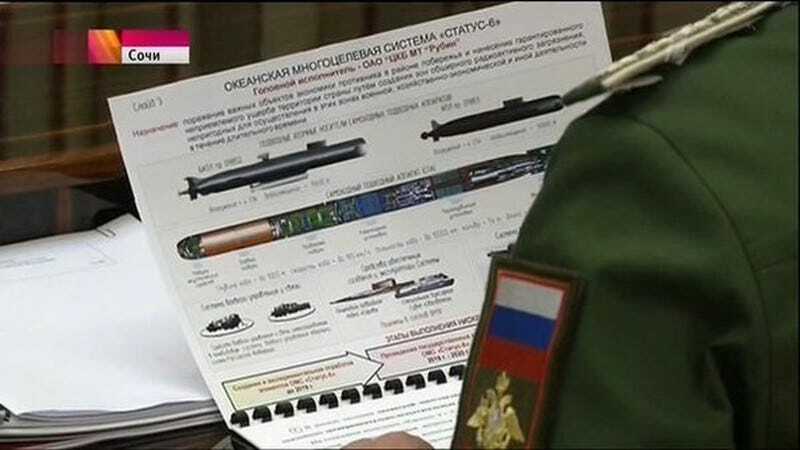 The supposedly “secret data,” which was subsequently shown on Russian television, revealed details of a “nuclear torpedo” designed to inflict “assured unacceptable damage” to enemy coastal installations. As RT reports, a number of TV crews in attendance at the Tuesday meeting captured footage of a presentation slide titled “Ocean Multipurpose System: Status-6,” which allegedly showed details of a new nuclear submarine weapons system. The Kremlin has admitted that the footage, which appeared on TV, was “secret data” that should have never been broadcast. The “leak” occurs at the 1:45 mark. Of course, it’s quite possible that this material was “accidentally” leaked on purpose—a veiled attempt at saber rattling. Indeed, it may have been deliberate; as the BBC reports, Russian government newspaper Rossiiskaya Gazeta has reported details of the weapon without any visuals, while also speculating about a super-radioactive cobalt device. More at RT and BBC.